If you've ever visited Shadertoy, you've probably seen ray marching in action. It's an interesting technique that can be used to generate fully procedural environments entirely from a single fragment shader. Unfortunately, there aren't a ton of great resources for learning these techniques. So, I wanted to create a quick tutorial on setting up a basic ray marching shader. I will be using Derivative's TouchDesigner for rendering, but you should be able to port this to any other 3D environment fairly easily. In future blog posts, we will build upon the topics covered in this tutorial to create more interesting scenes! Aside: If you are working with TouchDesigner, all you will need for this tutorial is a single GLSL TOP. In the "Common" tab, I changed the "Output Resolution" parameter from "Use Input" to "Custom Resolution," 720 x 720. One of my recent ray marching shaders - this example uses a smooth minimum function to combine multiple distance functions. As I hinted at already, when we use ray marching, we aren't dealing with polygons anymore. So, a lot of the things that we're used to in a typical 3D toolkit - geometry, lights, cameras - are nonexistent. But if we don't have points, lines, triangles, and meshes, how do we render anything? The trick is to use signed distance functions or SDFs (I will use these two terms interchangeably throughout this post). These are mathematical functions that take a point in space and tell you how far that point is from a surface. This can be somewhat confusing to wrap your head around, so maybe an example will help. Ok, so we have a basic SDF, and we know how to evaluate it at any point in 3D space. How do we actually use this to render something? In order to render our scene, we are going to use a technique called ray marching. At a high level, we will shoot out a bunch of imaginary rays from a virtual camera that is looking at our world. For each of these rays, we are going to "march" along the direction of the ray, and at each step, evaluate our SDF (the distance_from_sphere function that we wrote above). This will tell us: "from where I currently stand, how far am I from the closest point on the surface of our sphere?" Aside: If you are familiar with ray tracing, you might wonder why we can't just directly compute the point of intersection between our ray and our sphere. For this simple scene, we actually could do this! However, as we will see towards the end of this tutorial, the real power of ray marching lies in its ability to render shapes where this exact point of intersection is not as obvious. It turns out that a much better approach is to use distance-aided ray marching (sometimes called sphere tracing for reasons that we will see shortly). At each position along our ray, we evaluate our SDF, which, by definition, gives us the distance to the closest object in our scene. If we treat this distance as the radius of a sphere centered around our current position, we know that we can safely move forward along our ray by that amount without overshooting or missing any objects. These "bounding spheres" are represented by the four gray, stroked circles in the diagram below. Note that in practice, we might step many more times before terminating the ray. The diagram below shows this process in action. Our first scene will be much simpler than this, but for illustration purposes, it's helpful to visualize a more complex shape. Here, we imagine that we have a top-down view of our world (we are viewing the XZ-plane). 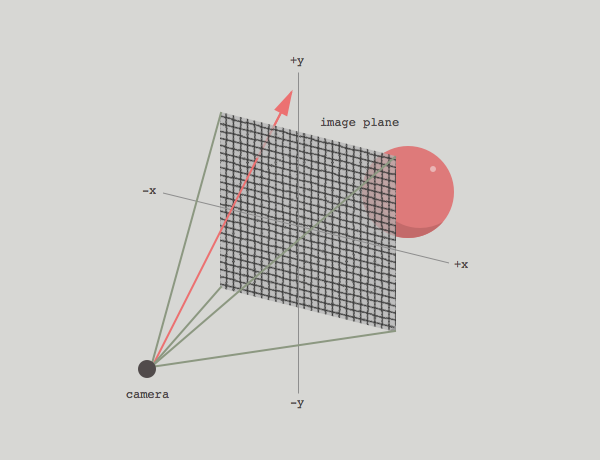 The dark gray box towards the bottom of the image represents our virtual camera, and the red line emanating from its lens represents a single ray. The green, mountain-like structure surrounding the camera represents some complex object (we assume that we have a SDF that represents this shape) that we are trying to render. Each position where we evaluate our SDF is represented by a small, blue circle. These points would be evaluated in the order drawn below, bottom to top. Each red X represents the point on the surface that is closest to the corresponding blue circle along the ray. So, we have a function that performs ray marching along a given ray. The last thing we need to figure out is, how do we generate our rays? We know that a ray has two components: an origin and a direction. We are going to imagine that each ray starts at the camera and passes through an imaginary "image plane" that sits somewhere in front of our camera. Remember that all of our code will execute inside of a single fragment shader, so there is a bit of a leap, where we somehow have to describe a 3D world from the 2D plane that our fragment shader executes over. A fragment shader executes once for each pixel that makes up our final, rendered image. At each pixel location, we can derive a UV-coordinate in the range [0.0, 1.0]. In TouchDesigner, this is passed from the vertex shader to the fragment shader as the variable vUV.st. Next, let's remap our UV-coordinates from the range [0.0, 1.0] to [-1.0, 1.0]. We do this largely for convenience, since it places the pixel at the center of our image at (0.0, 0.0). Now, in our imaginary 3D space, let's say that the camera is 5 units away from the origin, in the negative Z direction. To keep things simple, we aren't going to deal with things like FOV, camera rotation, etc., but we will likely cover some of these topics in the next tutorial. The Z-coordinate of rd acts sort of like the camera's FOV, pushing the image plane closer to or further away from the camera (you can try adjusting this later on to see the effect). For now, we will leave this at 1.0. So, since each fragment has unique UV-coordinates, each execution of our fragment shader will generate a unique ray. Keep in mind that because of the way shaders execute on your graphics card, all of these calculations will be happening in parallel! Now that we have a way to generate a unique ray at each pixel, we are (finally) ready to ray march! Now that we have our sphere, let's try to calculate some basic shading so that we can confirm that it is, indeed, a 3D surface! If you are familiar with diffuse / specular lighting, you probably know that we need normal vectors to calculate shading. For a sphere, the normal at any point on the surface can be calculated by simply normalizing the vector c - p, where as before, c is the sphere's center, and p is a point on the surface of the sphere. However, this method is limiting (it certainly doesn't extend to other shapes), and as we will see in the next section, when we deform our SDF, we need a more dynamic way of calculating normals. The idea is, we can "nudge" our point p slightly in the positive and negative direction along each of the X/Y/Z axes, recalculate our SDF, and see how the values change. If you are familiar with vector calculus, we are essentially calculating the gradient of the distance field at p. In 2D, you might be familiar with the derivative, which gives the rate of change of a function with respect to its input. You might also have seen this visualized as the slope of the line that lies tangent to the function at some point. The gradient is just the extension of this to functions of multiple dimensions (our SDF has 3 dimensions, X/Y/Z). Normals should generally be unit vectors, so we'll normalize it as well. This method lets us to calculate normals for arbitrarily complex objects, provided we have the appropriate SDF to represent its surface. Aside: I realize this explanation is a bit "hand-wavy" at the moment! It took me a while to understand how and why this way of calculating normals works. I recommend sitting with the code for a bit - after some reflection, it should start to make sense. I am working on a better way to explain / illustrate this and will hopefully update this post in the future with a more concrete explanation. You can play around with this effect: try using other combinations of sin and cos based on the coordinates of the position vector p to generate a displacement value. If you are working with a toolkit that implements GLSL noise functions (or you want to implement them yourself), you can try perturbing p with noise as well. Since we calculate our normals dynamically, the lighting should still be correct, regardless of how we deform our shape! These are all things that I hope to cover in future posts! If you want to start exploring on your own, I recommend taking a look at Inigo Quilez's website for inspiration.